http://hansaproject.ru/en - Internet-site of the EU "HansaLInks" project (full name - "Hanseatic Cities: Revived Historical Links for Modern Cultural Management"). The project is implemented by NGO "Lake Peipsi Project, Pskov" (Russia) in collaboration with the City of Pskov (Russia), the Hanseatic City of Rostock (Germany) and the Peipsi Center for Transboundary Cooperation (Estonia) from September 2010 to March 2012. 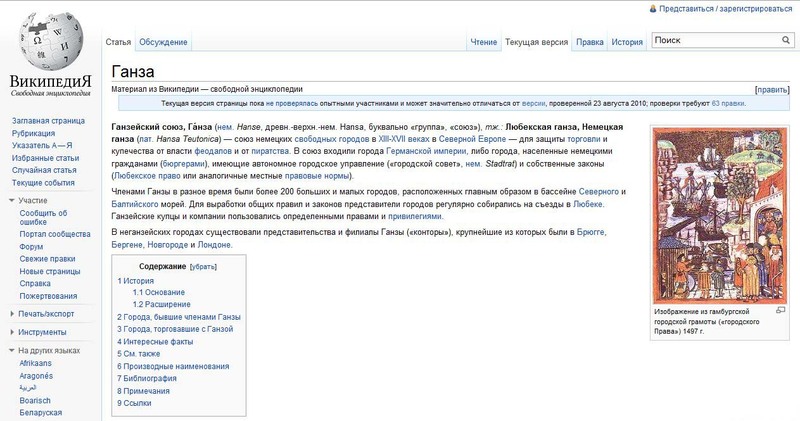 The web-site accumulates information about all of the project activities, aimed at the development of Russian Hanseatic movement; it operates in two languages - Russian and English; provides subscription to news and their exchange in RSS format. http://hanse.org - official web-site of the City League "The Hanse", - the biggest cultural association of cities in the world that unites 176 cities from 16 European countries, including 13 Russian historic cities - Belozersk, Veliky Novgorod, Veliky Ustyug, Vologda, Ivangorod, Kaliningrad, Kingisepp, Pskov, Smolensk, Tver, Tikhvin, Torzhok, Tot'ma. The web-site contains the News section, which covers events of the Hanse League as well as information about the cities-participants of the Hanseatic movement in two languages - English and German. http://1150.novgorod.ru/read/hanseatic-days - official web-site of the XXIX International Hansa Days in Veliky Novgorod in 2009. The web-site contains the whole information about the event. http://en.wikipedia.org/wiki/Hanseatic_League - Hanseatic League at the Wikipedia. The web-page contains general information about the history of the Hanseatic union. http://hansapaevad.ee - official web-site of Tartu's annual local Hansa Days - one of the most spectacular and effective Hanseatic events. The web-site is updated annually - for each next Hansa Days. www.hanzakaunas.lt - official web-site of XXXI International Hansa Days in Kaunas (Lithuania) in 2011. For the first time in history of the Hanseatic movement altogether 12 Russian cities took part in the event: Belozersk, Veliky Novgorod, Veliky Ustyug, Vologda, Ivangorod, Kaliningrad, Kingisepp, Pskov, Smolensk, Tver, Tikhvin and Torzhok. http://hansetag2012.de - official web-site of XXXII International Hansa Days in Luneburg (Germany) in 2013.